Chances are that if you have made it to this list that you are in the market for a new chainsaw. Whether you have previously owned one or this is your first purchase of one, it isn’t a decision to be made lightly. There are lots of reasons to own a chainsaw and each one of those reasons is best satisfied with a different size or style of a chainsaw. It can be overwhelming when trying to decide which one is best for you. There are many good options out there, and many of them are night and day different from each other. 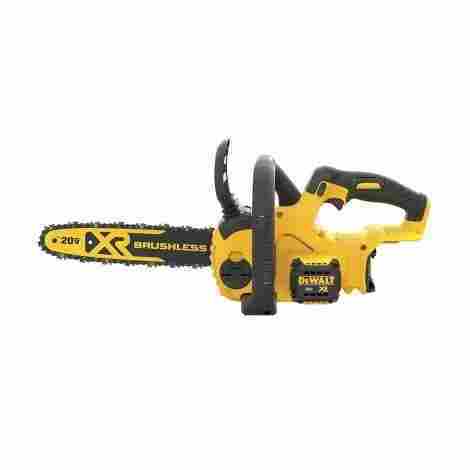 You don’t want to get stuck with a lemon, but very much want to get a good chainsaw that will help you accomplish all your landscaping desires whether big or small. Here we go over some of the best options out there and then we will discuss what you need to consider before making your purchase and how to choose which style will best suit your needs. Without further ado, let us dive in. This is easily one of the best medium duty chainsaws that money can buy. It has a 12” Oregon bar and chain, that might seem a little small for big jobs but is backed by an incredibly strong high-efficiency brushless motor that will have you cutting and cleaning for a lot longer than you’d expect. It is battery powered so there is no need to worry about cords or gas. It weighs in at 8.8 pounds and has a chain speed of 25.2 ft/s. This one is powered by a 20v Lithium Ion Battery. Coincidentally, it is part of an entire line of power tools from Dewalt that run on this same battery. That allows you to have fewer batteries and more tools as well as always ensure you have a second battery ready to go while you charge the first. This battery is powerful and long-lived. You will get a lot more life out of it than you may originally expect and get all the benefits of an electric chainsaw - less noise, no gas or spark plugs, and lighter weight. The DeWalt model will start with simply the push of a button. There are not a lot of things more frustrating than going out with a specific purpose - in this case maybe cutting wood for house building purposes - and not being able to get your saw to start. Maybe you’re out of gas or a spark plug needs replacing? Not the case here. You don’t have to worry about any of those things. This one starts when you push the button. Every single time. It’s hard to beat that. This is a very reasonably priced chainsaw. Considering all of the power it packs, the ease of use it can provide, and all that you’ll be able to do with it you will be beyond pleased with the small price you will have to pay. It can be purchased with or without the battery, but obviously costs more if you include the battery. However; if you already have a Dewalt power tool(s) or plan to get more, you can very reasonably function with one or two batteries. Your money is well spent on this one. 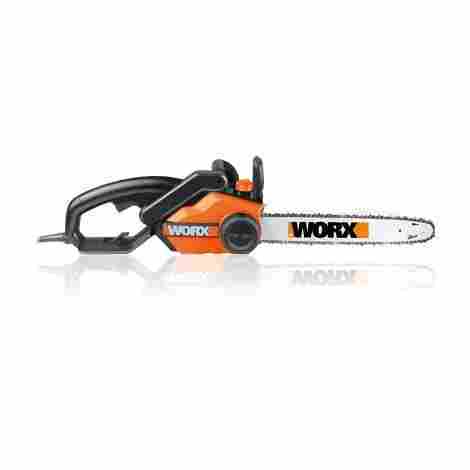 This is an 18 inch 4.0 horsepower saw that will have you wanting to get out and using it. It is lightweight at just 11 pounds, smart and efficient. It is electric but functions as well as any gas chainsaw does and will have others shocked when they find out there is no gas involved. The chain tension is easy to reach and maintain thanks to Worx patented auto-tension chain system. The handle is rubber and ergonomic and built so that you have easy control and constant comfort. Exclusive to Worx and this one is a patented auto-tension chain system. What it does is ensure your chain is always at the right tension - no more guessing or over tightening involved. It will extend the life of your chainsaw and will make is so that you never want to own one without this technology. There is only one oversized knob to secure the bar and chain that you’ll have to deal with and the chainsaw does the rest automatically. This Worx product comes equipped with an automatic oil lubrication system that includes a built-in 6.75-ounce oil reservoir. Not only that, but it also has a window level indicator. This way you will always know what your oil level is so that there no surprises. You will know when it is full enough, but also when it is nearing empty and needs more. In the long run, this saves you more time as there is no guesswork involved and no running out ever unless of course, you just don’t pay attention. Your chain and bar will always be ready to go! The price tag on this one is one of the rare cases when the price really doesn’t match the value. It is surprisingly affordable and should cost a lot more based on how well it works. You will get a lot of function for not a lot of money and be very happy with your purchase. This is a very handy little chainsaw. It is meant for smaller jobs and excels in that arena. It has a 10-inch blade and weighs in at 7.2 pounds which go a long way in preventing user fatigue and allows you to use up all the battery power should you wish before your arm tires. Speaking of, it is powered by a 20V battery that matches up with a lot of other Black and Decker tools, which is a convenient bonus. It also includes tool-free tension adjustment. As this is a lighter weight one meant for smaller jobs, it does feature a bar that has minimal kickback. It is a 10 inch Oregon bar that cuts well and functions perfectly in its intended purpose. This chain is a perfect compliment to your larger, potentially gas powered chainsaw that does all the heavy lifting. It is nice to have a smaller one available to maneuver and use with less stress and fatigue. It also goes a long way for those of us who may not have the muscle power to maintain a huge one for extended periods of time. The handles on this one may be a reason to purchase it in and of itself. They are well placed and truly allow for maximum comfort and movability. There is one on the back, which is where the trigger is located. There is also one that wraps from the top around the side. This allows you multiple options for where to hold your saw and provides excellent flexibility. You’ll be able to successfully do all of your small jobs, at whatever angle you need with this Black and Decker chainsaw. The best way to perform a job is first to know how to do it but secondly is to have the right tool for the job. This little one is the right tool for all of your small jobs. This is not the right tool for your big jobs nor will it cut down a full-grown tree so keep your expectations reasonable. As long as you do so, you will be more than happy with your purchase. It is priced accordingly, meaning that you will pay a smaller price here than you will for a bigger saw. You will absolutely think the smaller price was worth it and will love having this little chainsaw around. This Remington model is a sturdy little one that will handle all your limb and trimming needs. It is easy to use and lightweight and will easily be carried with you if you need to climb into a tree. It is a corded power tool and offers an 8 amp electric motor. It comes with a 14-inch bar for a little more functionality and chain and is fully assembled so that you can put it to work as soon as you get it home. A very convenient feature of this model is that it has a push button oiler. That allows you to simply push a button in order to oil your chain. It will deliver the correct amount and your chain will always be ready to go. This makes your life a lot easier than it is when you have to manually oil your chain, which is often the case in chainsaws at this price point. You will greatly appreciate the ability to simply oil at the push of a button. There are a lot of benefits to an electric saw that you don’t always immediately see. You will get all of those with this saw. There is no need to worry about gas or oil (other than for your bar and chain) or mixing them up. No fumes will ever escape from this one and you won’t have to idle when you are moving from one branch to the next - it simply turns on and off with the push of a button. It is lighter weight and more easily managed. This is easily one of the cheapest models on our list - by nearly half. You get a good amount of function out of this one and if all you need is to trim your limbs and little odd jobs, this is the perfect one for you. You will end up spending very little, though there is a good chance you’ll want a better chain and should spend money there. Overall, as long as your expectations are what they should be (you won’t be felling any full grown trees with this) then you will be quite satisfied with your very small purchase. This one packs a powerful punch. It is big enough and strong enough to cut down trees and hold up to its gas counterparts. It is easy to use and won’t let you down power wise. It has a powerful 14.5 Amp motor and does require you to purchase an extension cord. The bar is 16 inches long and capable of cutting through all sorts of trees. It is a powerful saw built with safety in mind for those who are somewhat novice when it comes to operating a chainsaw. Worx makes their models as user-friendly as possible. One of the biggest features they include is a patented auto-tension system that helps your chain to be just the right amount of tight, but not too tight, with no fuss on your part. You don’t have to know just the right amount of tension and how to get it there, you just adjust the oversized external knob and let the chainsaw do the rest all on its own. The other awesome thing they include is an automatic oiler that provides constant lubrication to both the bar and the chain. There is an attached 6.75-ounce reservoir so you have enough to do the type of bigger jobs you’ll be wanting to do with this one. In addition to being built as a user-friendly chainsaw, this one is also very safety friendly. That is incredibly important if you don’t really have any experience but have a job that requires a powerful saw. It has a built-in chain brake that will automatically stop the chain should any sort of kickback happen. This keeps you safer even when improper contact is made. Like the other Worx models on this list, the price for what you are getting in this one should be a lot higher than it actually is. It works really hard for you and will help you complete big jobs with enough power and durability to keep you satisfied for a fraction of the cost of its gas counterparts. It is comfortable, user-friendly, and most of all, it is cost friendly as well. Your pocket isn’t taking nearly as big of a hit with this one as it would with any other in this class. This is a solid saw with a 14-inch bar. It is built for medium to heavy-duty jobs and performs them with flair. The battery is built to last through 100 cuts - which is easy enough to fill the back of a pickup truck. 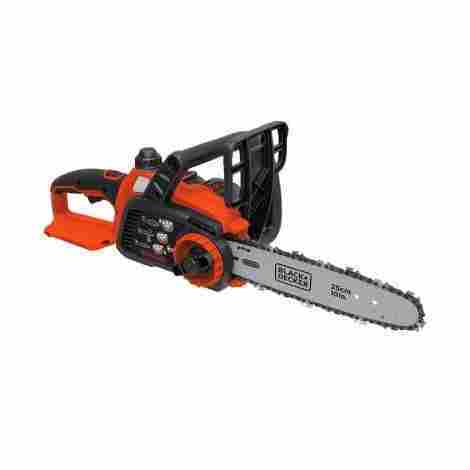 It has a brushless motor, which may cost more up front, but will mean your chainsaw lasts longer. It is comfortable and easy to carry and features a wrap around the handle so that you can more easily control no matter your situation. Yes, this is a battery powered chainsaw. No, that should not deter you. The 40V battery that runs this one will blow your mind. It easily lasts as long as you do and you are more than ready for the break if you’ve made it to the point of needing to charge it again. If you do have more work to do after the battery has run out, it takes as little as an hour to charge which is the perfect amount of time for you to take a break and recharge as well. This Greenworks model features a brushless motor. There are many advantages to a brushless motor. Typically they will last a lot longer than their brushed competition. That means more run time and less replacing on your end. The batteries on brushless motors also last longer. They are able to better compensate for the task at hand which extends battery life if it is an easier task. They are efficient and durable and serve you well over time. This is an awesome one that comes with a price tag. Fret not though, you easily get your money. This is a hardworking, long-lasting saw that will keep you happy and quietly cutting wood for a long time. It holds up nearly as well as its gas counterparts and is still less expensive than they are. 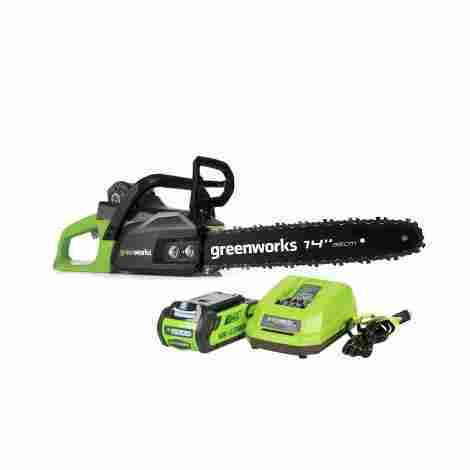 Overall, your money is well spent here as you get a powerful one with a long battery life that will allow you to cut almost any tree you need to. 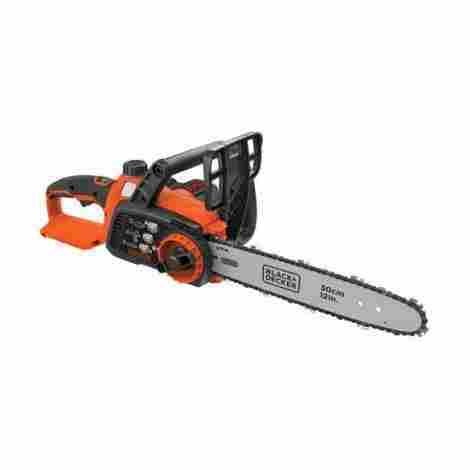 If you are looking for a chainsaw that is best suited for medium jobs, easy to carry, and lightweight then this is the Black and Decker saw for you. It has a 12-inch bar and chain and also comes with a 40V battery that will get at least 60 cuts of 4x4 pine on a single charge. It also is built with a full wrap around the handle that makes it ideal to use in any situation and at any angle. In addition, there is a whole family of power tools built by Black and Decker that use this same battery if you are into that kind of thing. This one comes with a built-in oiling system. This will help to lubricate your bar and chain without you having to go through all the fuss of doing it manually. While it does use a decent amount of oil, it will ensure that your saw is always oiled and good to go. Plus, it makes your life so much easier if you are someone who is used to having to manually oil your bar and chain as oiling is an essential part of maintenance and the life of your chainsaw. Getting the right chain tension is perhaps one of the hardest and more irritating things to do when working a chainsaw. It’s complicated and doubly so if you have to make sure to bring the right tools along every time just in case something happens that requires an adjustment. That issue is greatly minimized here because this one has tool free chain tensioning. There is an easy to use a knob on the outside that offers fast and easy adjusting whenever you need it without any additional tools. When you want to ensure that you are getting a great product, one of the best ways to do so is to go with a well-known brand who makes quality products that you are willing to pay for no matter the price. This is not the most expensive on our list here, but it is among them. However; you will purchase this and happily spend the price knowing that it is made by a company that has a long and good history of making quality power tools. This saw lives up to all of this hype and is worth the money you will spend on it. This one is a little bit different than all of the others on this list. It includes a 9-foot pole feature that allows you to stay on the ground while cutting and still get rid of all the pesky branches you need to. It is lightweight and has a 6.5 amp motor. It is a corded tool and simply starts at the push of a button. If the Grinch is in your tree and you have the same feelings towards him as Whoville residents do, you’re in luck with this one. It features a telescoping 9-foot pole which is good for much more than avoiding Dr. Seuss characters. It allows you to reach high branches without having to climb up into the tree itself your pack a heavy saw up a ladder and then balance yourself before cutting a limb off. It is safer and will save you so much effort. You can simply cut limbs up to 7.5 inches thick off while standing safely and securely on the ground beneath it. That also makes it very easy to ensure that nothing is below your limb before it falls. If safety is your jam, them this one will be too. Unique to this model is an adjustable head. What that means is not only can you cut down limbs while safely standing on the ground, but you can also choose the angle at which to cut. This gives this chainsaw much more variability and functionality than other pole chainsaws. The angles at which this saw can adjust to are 0 degrees, 15 degrees, and 30 degrees. 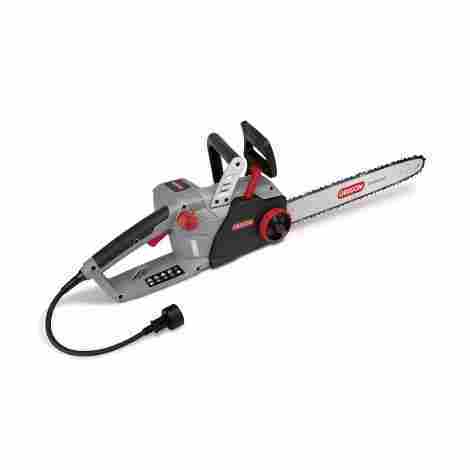 There are no branches in your tree that can avoid being cut down when they need to be when you possess this saw. This is a very inexpensive one. 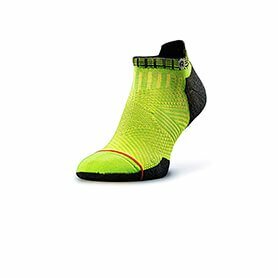 It is one of the cheapest on this list and will give you a lot of function. The ability to telescope your pole and reach tree limbs while standing on the ground would be enough to charge double what you will pay here. Sun Joe does an excellent job of creating a quality product and a very small price that your wallet will easily be able to handle and keep you coming back for more of their products. You will be very pleased with your purchase here and feel as if your money was well spent. The Oregon name has been mentioned several times already on this list. However; it has yet to be mentioned as a full chainsaw, but rather is the supplier for bars and chains on several others that we’ve looked at. It only makes sense that the company that makes some of the highest quality bars and chains for chainsaws, in general, would make a saw to use them on. Naturally, that model easily makes our list. This Oregon saw has an 18=inch bar and chain, is corded with a powerful 15 amp motor, and has a tool-less chain tensioning system. 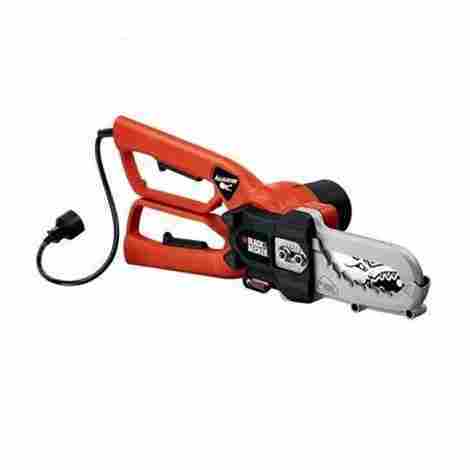 This saw can boast that it is the only corded electric chainsaw on the market that includes a self-sharpening system. That is a game changer. It makes a very large difference to be able to sharpen your saw without really affecting your workflow. There is no stopping or struggle on your end. This one is capable of doing that hard work all by itself! If you are someone who has no desire to own a chainsaw simply because you have no desire to sharpen it, because there will come a time that every chainsaw needs sharpening, then this is hands down the best choice for you. This one boasts all the benefits of having an electric saw without fully compromising the power you would get from a gas powered one. Because it is corded, you don’t have to deal with a battery running out or slowing your pace. It will function at or near 15 amps as long as you have the proper extension cord and a power source for as long as you want it to. It is lightweight and easy to carry. There is very little noise or vibration associated with this saw. It starts instantly with the pull of a trigger, there is minimal maintenance and no need to worry about gas or mixing gas and oil. This is a very reasonably priced chainsaw. Considering the fact that many of the others on this list have recommended in at least one review that you should replace the bar and chain with a better functioning Oregon one and this one comes with an Oregon bar and chain standard - you’re off to a good start price wise. On top of that, this one includes an 18-inch bar and boasts a 15 amp motor which makes it big and powerful enough to cut down some serious trees. Include the self-sharpening aspect and you should be paying a lot more than you are. You get a good bang for your buck and will be happy with your purchase. This Black and Decker Lopper saw is the smallest on our list. Its function is not to cut down trees, but to really help in cleaning up your yard. It is perfect for cutting small limbs or out of control bushes. It has a 6-inch blade that can cut up to 4 inches in diameter. It comes with a 4.5 amp motor which is far from the most powerful on this list, but that isn’t at all the purpose of this little saw. Unique to this saw is the fact that you use it like scissors which makes it very safe and nearly impossible to hurt yourself unintentionally. This saw is built and used much like scissors. When it is fully open, it looks much like an alligator, thus its name. When the jaws are fully open, it can fit over a 4-inch diameter branch, which makes it very functional for most of your trimming needs. It’ll function well when trimming smaller branches and bushes around the yard. You open and close it so it appears to be “eating” your branches when it is actually cutting them. You’ll enjoy using this handy tool. Unlike other models, this Alligator Lopper saw is smaller and lightweight at only 6.5 pounds. This makes it easy to carry and maneuver. You will be able to hold it at nearly any angle and most adults should be able to use it no problem. No extra muscles required here. The safety here is also unmatched. Because the blades are inside the mouth of the lopper it is nearly impossible to unintentionally hurt yourself. You would physically have to put your hand inside the jaws to do so. There are a lot of benefits to this little chainsaw that you will appreciate more and more, especially if you aren’t someone well versed in power tools. This saw is very reasonably priced. It runs mid to low as far as costs go on this list in particular. It is a little bit of a fancier tool rather than just a straight chainsaw, so that little extra added expense makes sense. Compared to the other Black and Deckers on the list, however; this one is definitely cheaper. It is a very functional tool and worItsike a charm. Its functionality will happily satisfy even the most novice chainsaw use and its safety is unmatched. If those are things you are looking for in a chainsaw, this is the one for you and your money will be well spent. Now that we have read all about which chainsaws are the best; let us talk about what you need to think about before buying a chainsaw. This is a big purchase that will either serve you very well for years to come or will not be the right size or tool for the job, drive you crazy, and make you replace it in a year or two. Let’s take the following things into consideration so that we can ensure the first option is the route you take. The very first thing you need to consider when buying a chainsaw is what will you use it for? It is important to have that nailed down before you attempt to make any other decisions as this one will affect what you end up buying more than anything else. If you only have a small yard with a random tree or two or some bushes, you’d likely be good to go with some Alligator Loppers. Or, perhaps, your yard is a little bigger than that and your trees are a little older and you need something a little more functional than that. There are plenty of excellent light duty chainsaws, several of which are on this list. If you fit into this niche, then perhaps a solid 10-inch bar and chain corded chainsaw would fulfill your needs. What if the only work you plan on doing with your chainsaw is trimming your very old, very mature, tree branches that are a good 10 or so feet off the ground? But, the issue you face is that you have no desire to climb up into your tree or use a ladder and would prefer to keep your feet solidly planted on the ground. Totally cool. 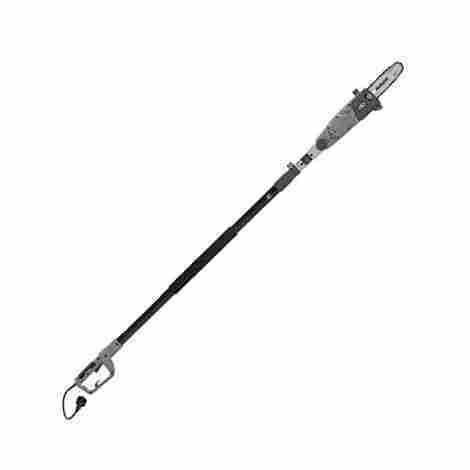 There is the option of a pole saw that extends up to 9 feet, in addition to the height you’ll be holding it at, that would absolutely fit your needs. Do you have a large yard full of big trees that produce a lot of mess? Are you constantly cutting trees down and need something with a lot of power that will last you until you have run out of steam? If so, then you will definitely want to get a much heavier duty chainsaw than those previously mentioned. A corded saw may not be a viable option as you are limited by the distance of the cord. That leaves battery powered or gas which can be much more easily carted around with you. This way you’ll be able to get down and cut up more trees in less time with more power and will be beyond grateful that you splurged and spent a little more on your chainsaw. What if you cut trees down for a living or need a chainsaw for professional use? You’ll want to stick with a heavy-duty saw as well, and ultimately have to decide if you want gas or electric which we’ll dive into a little bit later. 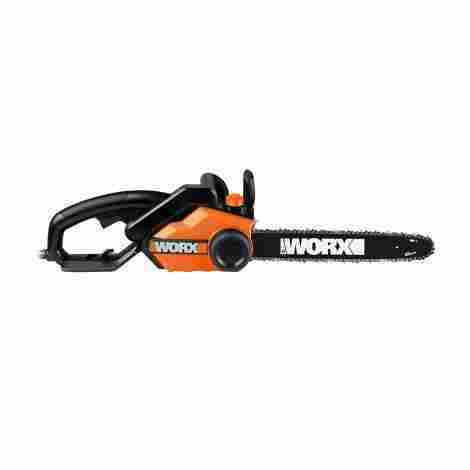 Lastly, are your chainsaw needs driven by the impending doom of a Zombie Apocalypse? If so, you’ll likely want to go heavy duty as well. I suspect it’ll keep you living longer. Unless you need to carry it all around with you, then maybe a lighter duty one could be of more use. I’ll leave that decision up to you. Now for the million dollar question that you must ask very early on in any power tool buying experience: Should I get a gas powered or electric (fill in the blank) – chainsaw in this instance. The pros and cons are very similar no matter what type of tool you are buying. Gas powered tools have more power across the board. They usually last for longer both while you are using them and they have longer lives in general. Both good things. They are more expensive and come with a lot of noise, fumes, and maintenance. Nobody loves any of those things. Gas tools are a must if you are in this for business reasons as you need to be able to make the most of your or your employees time and need as much power and life as you can possibly get. Electric power tools are either battery powered or corded. As such that limits either your mobility or your power supply as you can only go as long as the cord or battery does. However; you can get long extension cords and batteries these days tend to have very good run times and quicker charge times. They are quieter and have no fumes, minimal maintenance, and are typically easier for a novice to operate. They also typically pack a less powerful punch, although that isn’t true 100% of the time. But wait…there are no gas powered chainsaws on this list. What if that is what I want? Why aren’t any included? The fact of the matter is that we have pretty stringent requirements for putting items on our best lists and there were no gas-powered chainsaws that made the cut. Will you find one you love if that is what you need? Absolutely. 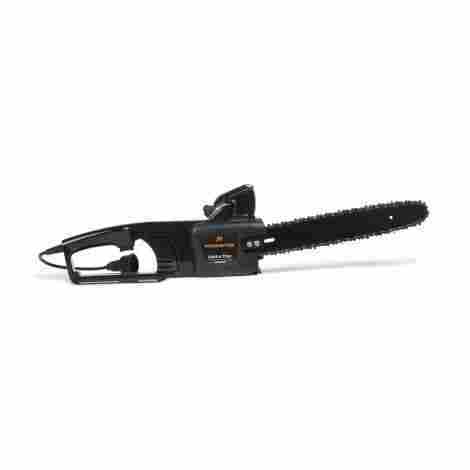 There are several companies that make a solid gas powered chainsaw that will serve you well when you are in the heart of the forest and need a very heavy duty tool. However; as there are a lot of drawbacks to gas chainsaws and electric ones have really made great strides over the years that is where we focused all of our energy. All of the chainsaws on this list met our strict requirements and are absolutely the best options out there. There is a chainsaw that will fit whatever need you may have unless that need is gas. Another variable among chainsaws is the length of the bar and chain. How long of a bar relates directly to the type of task you want to perform. But, you do have a little ability to choose and can do so with your specific needs in mind. Generally speaking, the longer a bar the bigger a job the chainsaw can do. Longer bars mean that you can cut through a tree in a single pass instead of two or three. That means more work done in less time. However, the longer the bar typically the heavier the equipment and the more weight you have to hold and manage while cutting. Shorter bar lengths are good for a number of reasons as well. First and foremost, they are lighter and easier to manage and maneuver. This is great if you are not among the strongest people around or don’t really have a use for a long bar. If all you need to do is trim trees around the yard, then you might be better off with a shorter bar. It’ll be less taxing on you and still do everything you need it to in just a slightly longer amount of time. You also need to keep in mind the size of the trees you will be cutting when considering bar length. If your tree is 20 inches long, then to cut it in one pass, which is the safest option, you’d need about a 22-inch bar. However; it can also be easily cut in two passes meaning a 12-inch bar would do the trick. It is best practice to add two inches on due to how the bar is inserted into the casing. Who will be Using the Chainsaw? Finally, you need to take into consideration who will actually be using the chainsaw. Are you a fully grown, strong, and capable adult? If so you will be much more likely to be able to heft and use a bigger heavier saw for a longer amount of time. Odds are also good that you are old enough to take proper safety measure and know how to keep yourself safe at least a little bit. This increases greatly if you are also trained to use a chainsaw and do it professionally. You will easily be able to handle any chainsaw you pick up and don’t need to worry about weight or length of time or safety – because you are already an expert on all of these things and will take the proper precautions. Perhaps you are a little older and a little weaker than you used to be? But you still want to do the work yourself? You may be better suited to get a slightly less heavy, slightly less powerful chainsaw. It will still do everything you need it to, but at a pace, that is more comfortable for you to work at. You won’t have to sling around heavy chainsaws and put yourself or others at risk. Or maybe this is your first chainsaw and you need to learn what you are doing? Here again, you would be well off with a little bit smaller and a little bit safer chainsaw. Perhaps one that has easier holds and an automatic stop. Other good options would be alligator loppers or a 10 to 12-inch bar. This will allow you to learn your way around a chainsaw, accomplish the work you need to be done, and help keep you safe and happy while doing so. Q: Does this chainsaw come with a case? A: No, most do not but they can frequently be bought separately. Q: Is the chain pre-sharpened or do I need to sharpen it? A: Most come pre-sharpened, but may have inferior chains to start with that dull easily. Do be aware of that possibility and consider getting a better chain or a self-sharpener. Q: How big of a branch can be safely cut with this saw? A: Add two inches onto the length of the bar and that is the size of tree you can cut in one pass. It is also very reasonable to cut in two passes, in which case you could reasonably cut a 20-inch tree in two passes with a 12-inch bar. Q: Do I have to get brand specific chainsaw oil or can I just use a generic version? A: Personal preference; though it may function better and not break your warranty if you use brand specific oil. Q: Does this Chainsaw come with oil or do I need to buy some separately? A: Some do, most do not. Be sure to read the contents before purchasing so you can know to buy oil at the same time or not. Q: How heavy is this chainsaw? A: Typically the larger the chainsaw the heavier it is. They can be as light as 5 pounds but can be very heavy the bigger you get.